Growing fruit trees can be a beneficial addition to any survival homestead or self-sufficient backyard farm. Not only will they provide years of beneficial and nutritious fruits, but could be a ready source of income or barter in the future. However, to get to the future you need to understand a few basics, such as light, drainage, best trees for your area, fertilizer, pests, and diseases. On average, fruit trees come in three different sizes: dwarf, semi-dwarf, and standard. Dwarf fruit trees – Smaller than the average fruit trees, dwarf trees only need about an eight-foot diameter plot, and are easy to prune and harvest. Drawbacks are that they don’t produce as much or live as long as standard trees. Semi-dwarf fruit trees – Reaching heights of 10 to 15 feet and requiring at least a plot of 10-feet in diameter, they do require regular pruning and shaping. However, they are usually heavy producers, only occasionally seeming to take a year of rest where they produce less after a season of heavy production. Most trees that you buy from nurseries and gardening stores are semi-dwarf for their ease of care and fruit bearing. 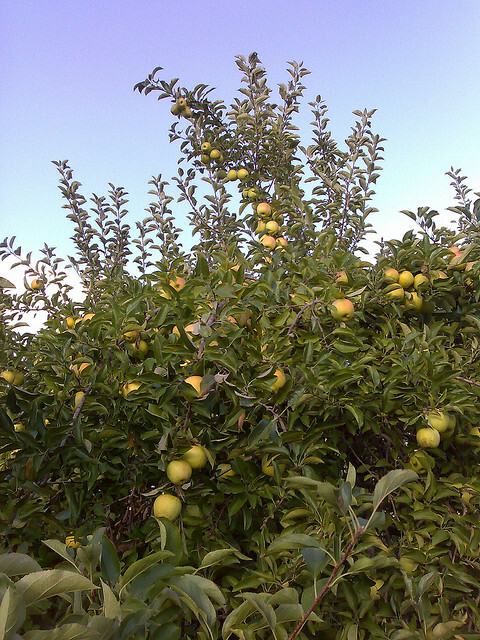 Standard fruit trees – If left unpruned they can reach heights upwards of 30-foot and require a great deal of space. Because of their height and the difficulty pruning, spraying and picking of the fruit, they are being replaced in favor of growing fruit trees that are smaller and more compact. When growing fruit trees, naturally you are going to want to plant a variety that is local to match your particular soil and climate, which is suited to your zone. You’ll also want to select self-pollinating trees, or plant pairs of those trees which are not self-pollinators. Finally, plant a couple of different varieties of the same fruit tree, choosing those which reach harvest at different times in the season, or produces fruits that keep the longest. Leader – this is a central stem or trunk that goes all the way to the top, from which all the other branches start. It should be strong and straight. Branches – should be balanced in a candelabra formation, extending evenly from and around the trunk. They shouldn’t start too low on the trunk, but at least half way to three-quarters of the way up from the roots. Roots – should not be exposed or obviously dried out, but have been kept moist and protected. When you get the tree home, you should have already determined where to plant based on the soil drainage of that location. Remember that growing fruit trees don’t like wet soil or poor drainage. Add some of the dirt back in a mound in the center of the hole. Put the tree in the hole, making sure that the graft line is about three inches above ground level. Spread the roots out, down around the mound. Make sure the tree is standing straight. Refill the hole with the dirt, letting it mound up several inches above ground level, knowing it will settle and sink with watering. Stake the tree with two or three lines covered with cloth or a bit of old water hose so as to not strangle or girdle the tree as it grows and expands. Mulch the tree to help keep the soil around the base moist. Place a fence around the tree, especially if you have goats, donkeys or deer around, all of which would strip the bark off your new tree in a matter of seconds. When growing fruit trees, getting them planted is just the first step. You’ll need to make sure you water them frequently, especially that first year to help get the roots established. Then you’ll need to prune the tree, guard against pests and disease, and within a few years you should be enjoying delicious fruit right off your own trees. You won’t believe how good they taste.